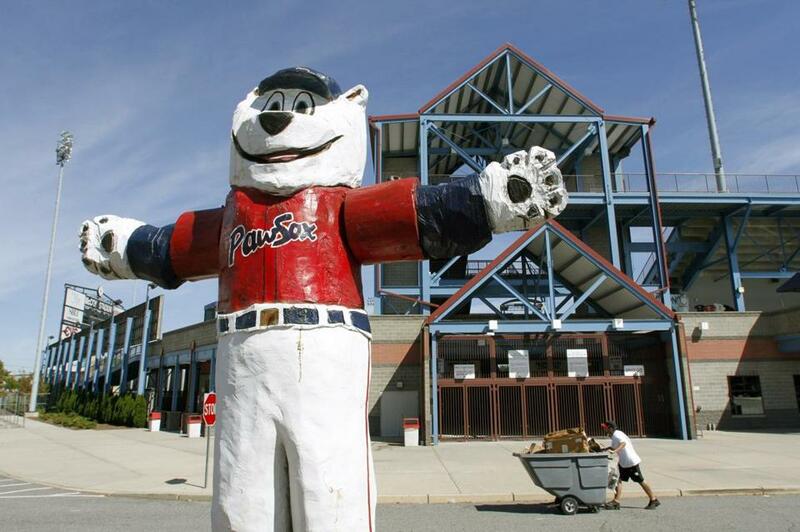 The Pawtucket Red Sox mascot "Paws" stands outside McCoy Stadium in Pawtucket, R.I.
FORT MYERS, Fla. — The Pawtucket Red Sox have been sold to a group that includes Red Sox CEO Larry Lucchino, and the owners hope to move the popular Triple A team to a new stadium in Providence, officials said Monday. Skeffington will serve as team president. The team would stay at least two more years in Pawtucket, allowing time for negotiations with local officials, the acquisition of land, and the construction of a new stadium, team officials said. If the team does move, it would shed the familiar “PawSox” moniker it has had since 1977. Skeffington said he hoped to call the team the Rhode Island Red Sox. “The Boston Red Sox have enjoyed a productive relationship with the Pawtucket Red Sox for more than four decades,” said Lucchino, who, according to the press release, will continue as Red Sox CEO/president. “The franchise has played key roles in the Red Sox’ historic success, both as a player development affiliate and as a Rhode Island home for affordable family entertainment. “We seek to enhance those roles, and to honor the substantial contributions that [longtime PawSox owner] Ben Mondor and his loyal team have made to this community for generations,” Lucchino said. In a conference call, Skeffington described a plan to leave Pawtucket and the team’s longtime home at McCoy Stadium and move to a new ballpark in Providence within walking distance of downtown. The new owners have identified a site along the Providence River that would offer the possibility for home runs to splash into the city’s central body of water. Mayor Don Grebien of Pawtucket said in a radio interview that city officials were informed of the new owners’ plans on Sunday evening. He characterized the news as devastating, the Associated Press reported. Providence councilwoman Sabina Matos described the team’s possible move as bittersweet. “It has been in Pawtucket for so long and it’s part of the identity here,” Matos said. For Matos, the objective is to keep the team in Rhode Island. “We are excited about the possibilities in bringing the team to the downtown area and adding to the rest of the activities taking place in downtown,’’ she said. Lucchino and Skeffington are both members of the new ownership group, as is Fenway Sports Management, a subsidiary of Fenway Sports Group (the parent company for the Red Sox). Two minority Red Sox partners, Arthur Nicholas and Frank Resnek, are also part of the group, which is rounded out by Bernard Cammarata (chairman of the board, TJX Companies), William Egan (founder of Alta Communications and Marion Equity Partners), Habib Gorgi (managing director, Nautic Partners), Terrence Murray (former chairman, president, and CEO of Fleet National Bank), and Thomas Ryan (former chairman, president, and CEO of CVS Caremark), according to the new owners. Each of the 10 members has a 10 percent stake in the club. Lucchino and Skeffington will serve as the franchise’s principal owners. Daily operations will be led by the same management team — Mike Tamburro, who will serve as CEO; Ludwig Schwechheimer, who will serve as general manager; and Mike White, who will be COO and CFO — that was in charge of its day-to-day operations under the previous owners. Red Sox principal owner John Henry also owns the Globe. Pawtucket has been the Triple A club of the Red Sox since 1973. However, the franchise fell into bankruptcy after the 1976 season, falling in danger of leaving the city, until Mondor purchased the team that year. Mondor passed away in 2010. His wife, Madeleine, then became the team’s principal owner . Even those who recognize the potential for a modernized fan experience acknowledged feelings of ambivalence at seeing the Mondors’ stewardship of the club come to an end. But for those who have played in McCoy Stadium, which was originally built in 1946 and renovated in 1998, there is clear merit in a move to a new park in Providence. The construction would be in the hands of Lucchino, considered the force behind the renovation of Fenway Park and the construction of Camden Yards in Baltimore and Petco Park in San Diego. “My first thought is that you’re kind of cutting ties with Ben, unfortunately,” said former Red Sox infielder Lou Merloni, who spent parts of seven seasons playing for the PawSox, and is now a local radio broadcaster. “I don’t want to. It kind of hurts to think they would even move it. “When I think of the PawSox, I think of him, and I almost think [the team] should stay [in Pawtucket]. But I understand why they’re doing it. This is the age of improvements, and I think people will be pleased if they do move that stadium, what it will look like. “Providence’s downtown area is so improved, I think it would be beautiful. I think that the fans who will miss McCoy will enjoy the new stadium,” Merloni said. But if the move comes to fruition, the fans won’t be cheering for a team that is called the PawSox. globe.com. Follow him on Twitter @alexspeier.